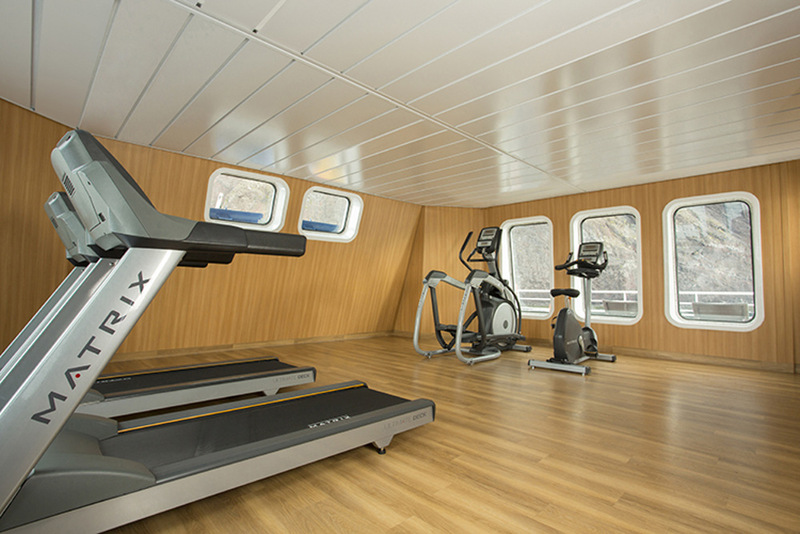 The Santa Cruz II is a state-of-the-art premium expedition vessel. 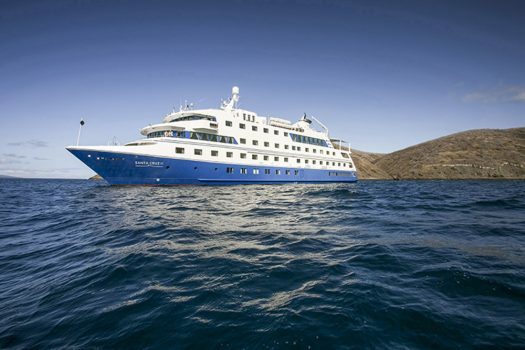 By Galapagos standards this is a relatively large vessel, accommodating up to 90 passengers over five decks. This size allows for generous public spaces indoors and out – you’ll find hot tubs, a gym, library and ample decking areas. 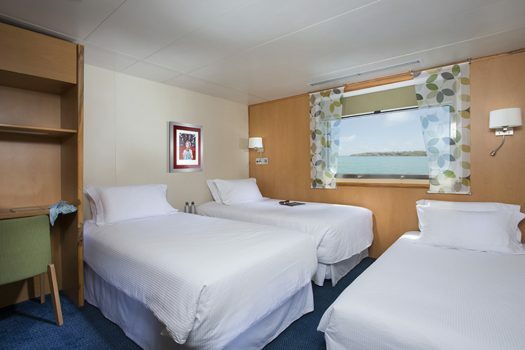 The option for interconnecting rooms will particularly suit families and an on-board doctor will reassure travelers with any health concerns. Guiding is first-class, with a guest-to-staff ratio of 3:2. 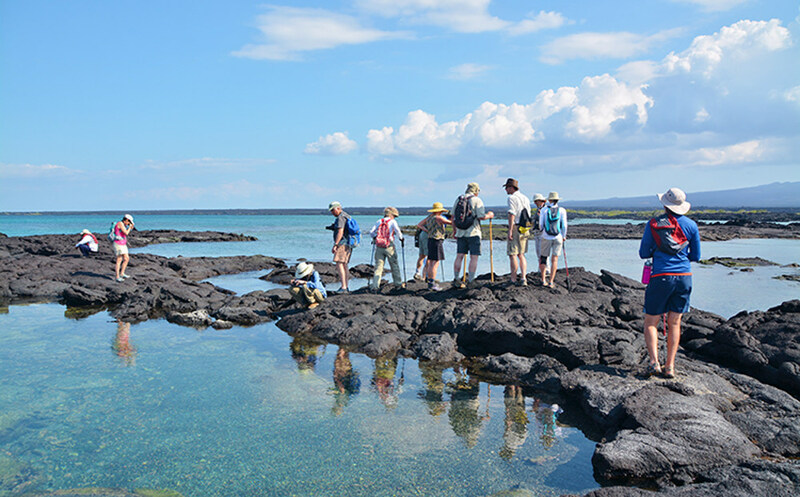 Santa Cruz II is one of our handpicked vessels and one of the largest Galapagos cruises we recommend – read our detailed review of the Santa Cruz II. The Santa Cruz II has 50 modern cabins, adopting stylish-simplicity in its approach to neutral decor with deep blue carpets, white linen and light wood wall panelling. 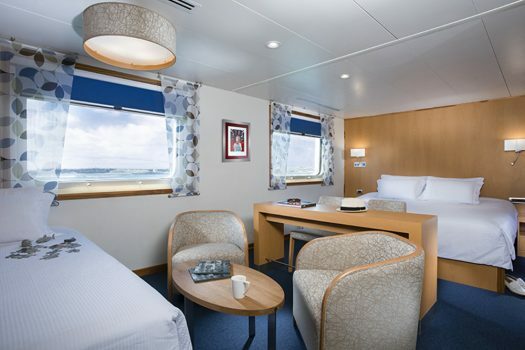 This is a comfortable, rather than luxurious cruise. 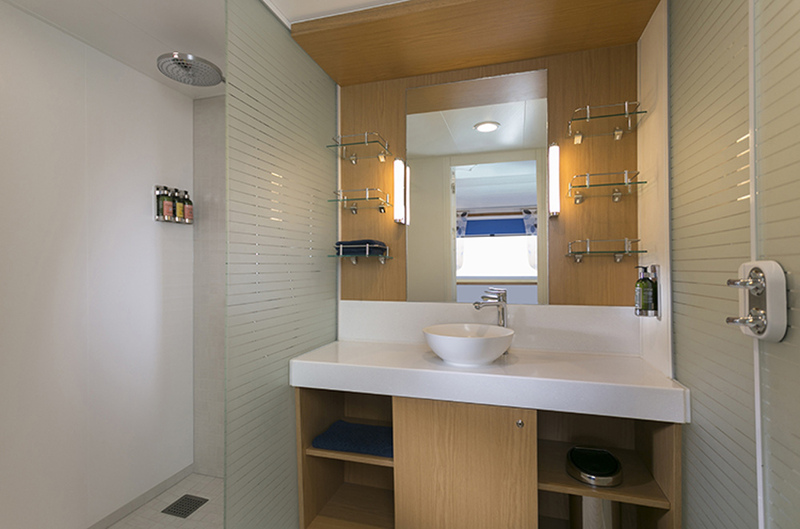 There are single, double and family cabins, with the option to upgrade to more spacious and luxurious Darwin Suites on the boat’s Panorama Deck. A total of 36 rooms are interconnecting. Though no rooms have balconies, they all have very decent-sized windows so you might spot sharks at night in the ship’s lights or Mola Mola’s in the daytime. All rooms offer air-conditioning, with both beach and bath towels provided. There are also hair dryers in each room and a small desk . There are forty-three Explorer Cabins, located on the Horizon Deck (23), Expedition Deck (17) Panorama Deck (3). They are all the same size with beds that can convert from double to single. 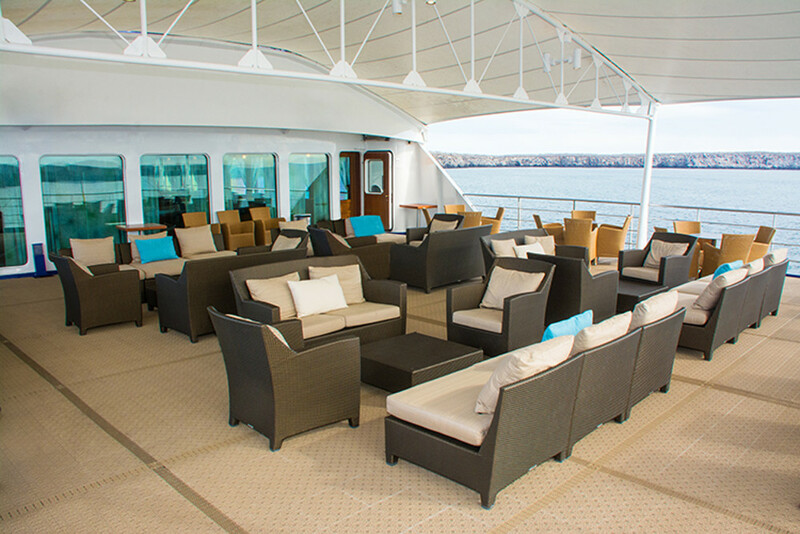 There are just 3 Darwin Suites are located on the Panorama Deck. 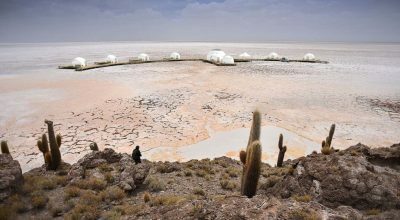 These feature double beds, picture windows and deluxe amenities for more discerning travelers like a take-home Galapagos coffee table book and a tablet loan. Rooms are more spacious, at 30m2, with a sofa and table. They can interconnect with an Explorer double cabin, ideal for families. 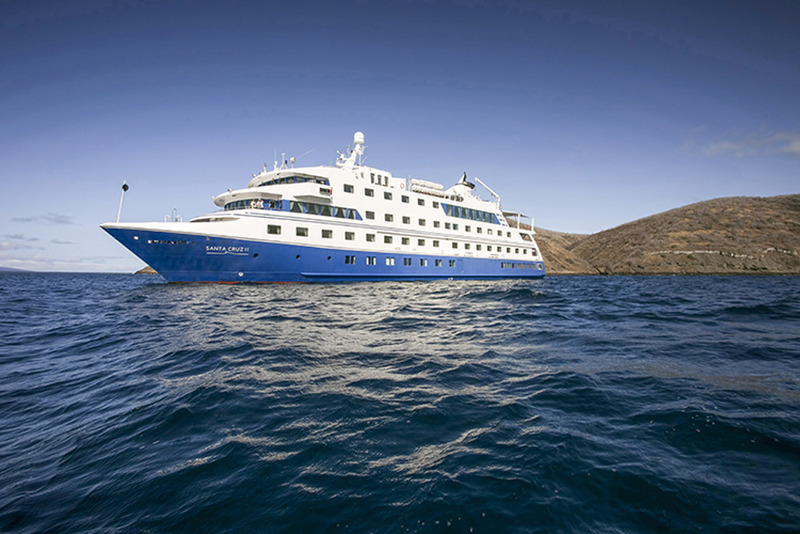 The Santa Cruz II is classed as a ‘large’ vessel by Galapagos standards – though ‘large’ is relative, as you’ll find no Caribbean-style cruises in the Galapagos thanks to careful regulation of this protected area. Nonetheless, thanks to its comparatively spacious size there’s plenty of rooms for guests to spread out in the common areas, indoors and out, and extra facilities like a glass-bottom boat and kayaks for exploring. Larger ships also give you greater chance of meeting more people during your expedition. 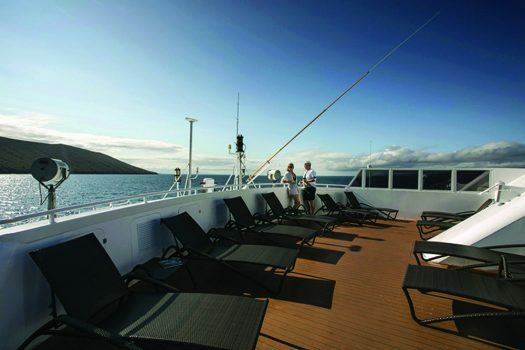 The Sky Deck at the top of the boat boasts a handul of deckchairs for sunbathing, where you might spot frigate birds soaring alongside the ship. On the same level is a small gym, including running maching, cross trainer, weights and bike. On the Panorama deck there is a large outdoor terrace, with a BBQ. The bar and lounge inside is spacious, with complimentary snacks and a happy hour before each night’s briefing on the next day’s activities. On the Expedition Deck, there’s a library, as well as an outdoor balcony with great views. The library is stocked with a 24/7 coffee maching, alongside biscuits and sweet treats which are included in the rate. On the same level you’ll find a multi-purpose games room (the Discovery Room) kitted out with board games, chess, a TV and DVDs – an area which is used in the day time to entertain kids on board. On the Horizon Deck there’s a gift shop, which stocks supplies like sun cream should you run out. There’s also a permanent medical Doctor on-board (consultations are free of charge). Furthermore there are two hot tubs outdoors on a deck – perfect for taking a dip after snorkelling in cooler waters – wetsuits are available for hire. Dryers are available for free usage, which comes in handy after water activities. An onboard photographer accompanies the cruise, providing the photos for free via a weblink after the cruise. Guests are also welcome to visit the Bridge during sailing, to see the sailing crew at work. 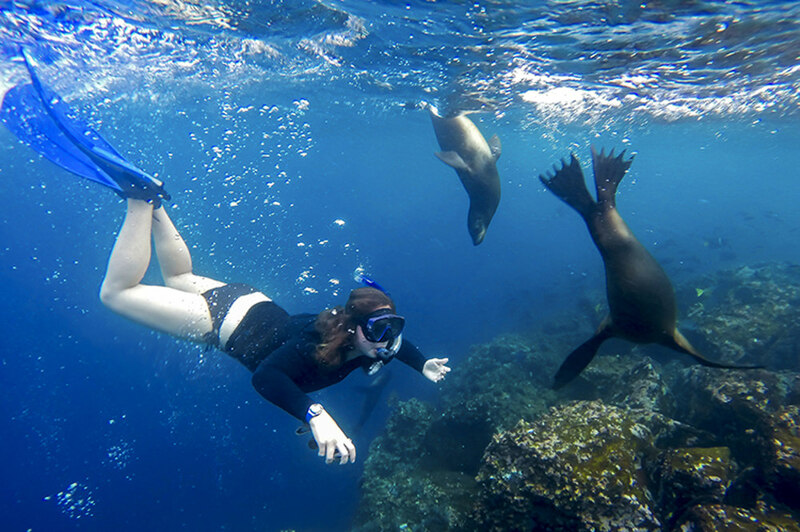 As with all top cruises in the Galapagos, WiFi is not available but can be purhcased at additional cost – this is via satellite connection, so connectivity is slow on all vessels. Dining on-board takes place in the bottom deck. Breakfast and lunch are buffet-style, with dinner a la carte with waiter service. 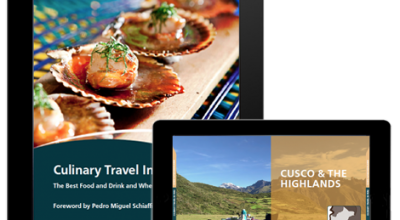 There are a wide range of options, from local Ecuadorian dishes to international favorites. The chef will set up a BBQ outdoors on the deck during the cruise. The dress code is ‘cruise ship casual’ – there’s no formal night, so dress comfortably, even for dinner at night. 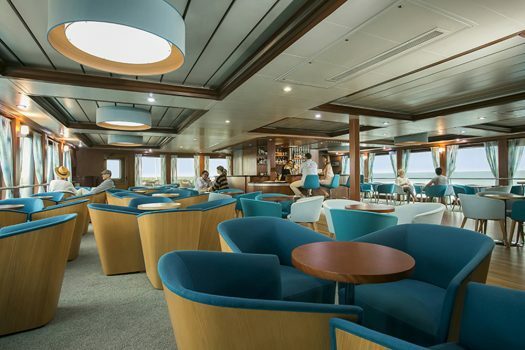 You don’t make reservations for dinner, so you if you’re traveling as a couple you can opt to sit on a table for two, or take advantage of one of the benefits of a larger cruise and get to know your fellow passengers – it’s entirely up to you. The guides on the Santa Cruz II are first-rate. Tours take place in small groups (up to 16 per group, averaging at 11), each assigned a name after a local bird or animal. Announcements and guiding on board is offered in English and Spanish, with passengers divided by language for excursions. 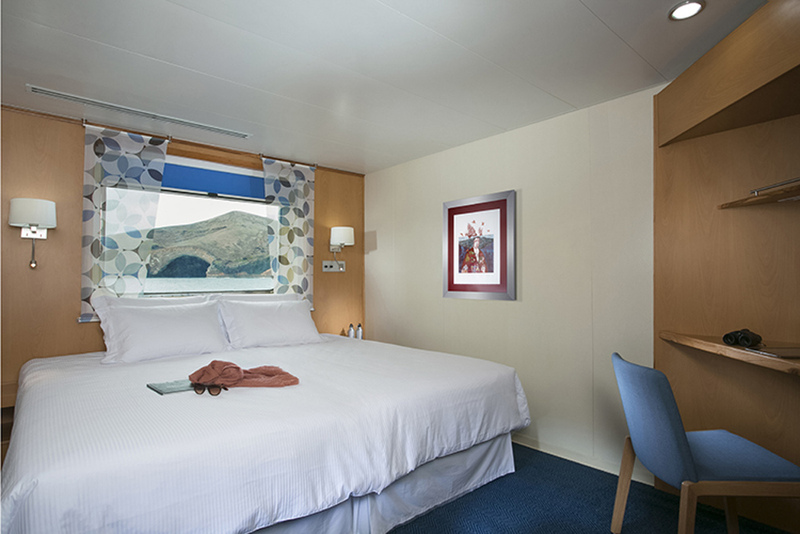 The guide Manager provides nightly briefings and information, as well as additional lectures depending on your cruise, for example a photography talk. 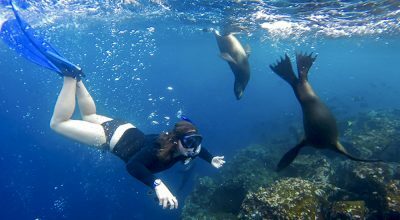 All itineraries in the Galapagos including ample wildlife-watching opportunities and aquatic activities. 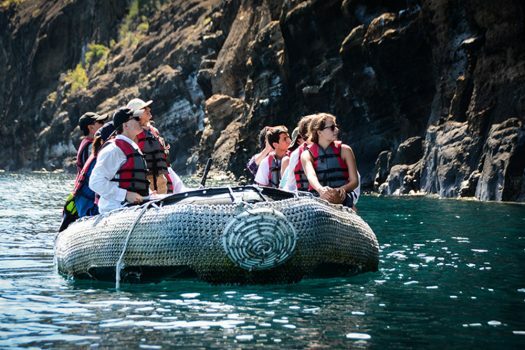 Excursions are carried out via pangas – inflatable dinghies, typically with a combination of dry and wet landings. Being a larger cruise, you can expect diversity in the passenger makeup. 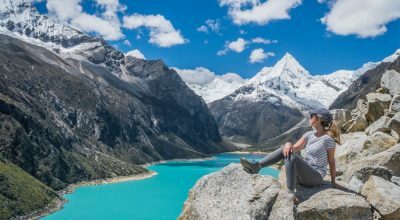 The majority of travelers tend to come from the US, UK and Germany, but there are always a mixture of nationalities, with a mix of tour groups, multigenerational families and couples. There are sometimes honeymooners, but our recommendation is to opt for a smaller and more intimate vessel if you’re on a honeymoon. Ages on board vary from 20s-70s+. Expect there to be more children on board during major school holidays.